The biggest drawbacks in NBA Playgrounds – in no particular order – were the lack of offline content (such a season or tournament mode), makeshift matchmaking without the backing of dedicated servers, and some clunky/outdated AI and mechanics. A few of the patches did improve the experience in my view, and although there was some controversy with the paid DLC on offer, Saber did add quite a lot of new content free of charge post-launch. The end result was a game that was solid and commendable, but in some respects, a poor man’s NBA Jam combined with elements of NBA Street. Nevertheless, the game wasn’t bad, and the brand clearly had the potential for sequels. Judging by the official announcement of NBA Playgrounds 2, Saber Interactive has listened to what fans said about last year’s game. The new worldwide online league, offline season mode, and apparent gameplay enhancements suggest that they’ve focused on the right areas, which may make NBA Playgrounds 2 the game that we were hoping the original would be. That’s a promising prospect, but it also invites cynicism. As gamers, we tend to take a more pessimistic view of such scenarios, grumbling that we’re simply getting the game we paid for and should’ve received last year. For those who were particularly unsatisfied, it’s akin to paying to be beta testers. That is a somewhat harsh and myopic view, though I don’t entirely disagree. More to the point, it’s something that Saber will have to address in order to win over some of those disgruntled basketball gamers. My suggestion would be to offer a bonus for returning players, similar to what NBA Jam: OFE did. Upon detecting an NBA Jam 2010 save, it granted the user a bunch of Jam Points to immediately start unlocking content. NBA Playgrounds 2 could take a similar approach with users who bought the first game, perhaps offering additional packs with high odds of pulling good cards, or maybe even a Legend of the user’s choice, upon firing up the game for the first time. Demonstrating that kind of goodwill with NBA Playgrounds 2 is a must, not only in terms of rewarding people’s support of the first game despite its issues, but indeed repairing Saber’s image after alienating some gamers by offering paid DLC. It would also be a wise move given the controversies surrounding NBA 2K18, and the lack of goodwill that Visual Concepts has demonstrated. While that obviously isn’t Saber’s problem, basketball gamers are feeling burned, and very wary of any kind of anti-consumer tactics. It would be in Saber’s best interests to reward the fanbase for their trust and loyalty with gestures of goodwill, such as a “welcome back” bonus. Furthermore, the game must deliver. 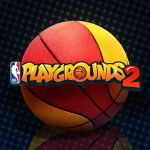 The new features that Saber’s CEO Matthew Karcher discussed in his post over the official PlayStation blog do sound good, but NBA Playgrounds 2 must live up to the hype. The gameplay must show improvement over the original. Season mode needs to be engaging, and provide replay value. The online experience has to be robust, balanced, and inviting. Grinding should be kept to a minimum, with progression and player unlocking systems that are enjoyable and feel rewarding. Some gamers are feeling jaded and burned by NBA Playgrounds, and that means the sequel needs to do all that it can to win them back. At the same time, it’s important that we gamers hold Saber Interactive accountable in terms of delivering a great product in NBA Playgrounds 2. I’ve already seen a few new posts in the official Facebook group chiding people for criticising the game, often pointing to the price tag. That’s exactly the kind of toxically defensive attitude that I discussed in my previous article, and it’s not what the NBA Playgrounds community should be doing. After all, NBA Jam: OFE was even cheaper when it was released in 2011, and it was a much deeper game. Granted, EA Sports is also a much bigger studio than Saber Interactive, but that doesn’t mean we should set the bar low. 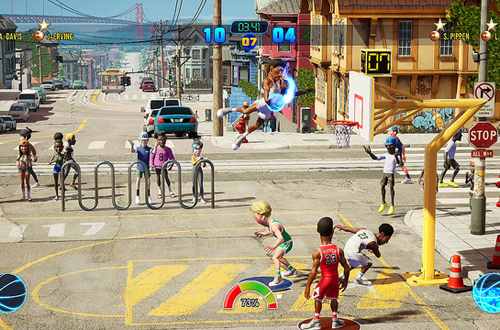 We should have high expectations for NBA Playgrounds 2 and hold Saber Interactive accountable, because the game has great potential. Instead of simply being a decent to pretty good NBA Jam clone with elements of NBA Street, it could be the great arcade basketball video game of this generation. NBA Playgrounds fell short of that goal, but now Saber has an opportunity to learn from its mistakes and build upon the good parts with the help of gamer feedback. If we stifle criticism, then we’re doing ourselves a disservice as consumers, and wasting our opportunities to help the Playgrounds team realise the potential of the game. Remember: fans, not fanboys; critics, not haters. I hope that Saber can make the most of this opportunity, and that the game we get later this year lives up to our expectations. While I did feel some disappointment with NBA Playgrounds and believe that it missed an opportunity, I did also enjoy it, so I’m glad to see that Saber are willing and able to try again. 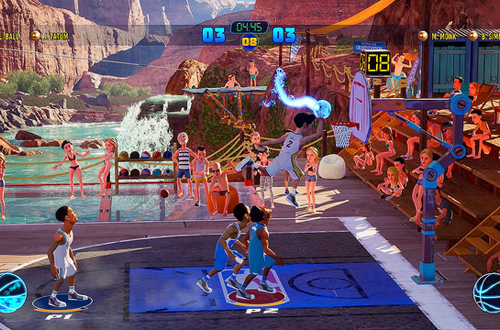 For those who greatly enjoyed last year’s game, hopefully NBA Playgrounds 2 will be what NBA Jam TE and NBA Jam: OFE were to their predecessors, making an already great experience even better. For those of us who were left wanting more, hopefully Saber will be able to deliver this time around. It’s a golden opportunity that they must not squander.